Looking to make a move to the cloud, Blue Shield of California chose Workday for their new HRIS. 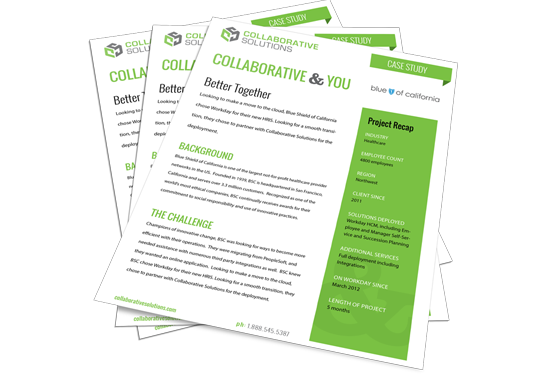 Looking for a smooth transition, they chose to partner with Collaborative Solutions for the deployment. Blue Shield of California is one of the largest not-for-profit healthcare provider networks in the US. Founded in 1939, BSC is headquartered in San Francisco, California and serves over 3.3 million customers. Recognized as one of the world’s most ethical companies, BSC continually receives awards for their commitment to social responsibility and use of innovative practices. Champions of innovative change, BSC was looking for ways to become more efficient with their operations. They were migrating from PeopleSoft, and needed assistance with numerous third party integrations as well. BSC knew they wanted an online application. Looking to make a move to the cloud, BSC chose Workday for their new HRIS. Looking for a smooth transition, they chose to partner with Collaborative Solutions for the deployment. After a fast deployment, BSC has been able to reduce single person dependency, loosening up bottlenecks and increasing workflow. Next steps include more mobile functionality as well as self-service reporting.